While Jacó is Costa Rica's hotspot for holidays and sunbathers, it also offers great surfing, as it hosted the 2016 International World Surf Championship last August. Just a few kilometers south you'll find some great waves in Playa Hermosa, home of the 2009 Surf Championship. Nicaragua is no longer a best-kept secret, with thousands of North American surfers hitting the white sand and thick jungle of Popoyo every winter, usually passing through charming San Juan del Sur its surrounding beaches. You'll find everything from gentle swells for beginners to a dozen huge breaks a short boat ride away. According to Johnny G., owner of San Juan Surf, "With friendly locals, offshore 300 days a year, and uncrowded spots all along the coast, your chance of scoring here is much higher than anywhere else in the Western Hemisphere." This cluster of islands off of Panama's Caribbean coast includes some of the best reef breaks and hidden beaches in Central America, all accessible by water taxis. "The Mouth of the Bull" is truly a unique and beautiful place for those that make the trek, and when the surf is on, it's on! Don't forget about Costa Rica's Caribbean side, with amazing surf from December until May in this charming coastal town, including the heaviest waves around. Head north along the western Costa Rican coastline and you'll find Ollie's Point near the Nicaraguan border, named after the disgraced U.S. military figure Ollie North. You can only get to this epic right point break by boat, but the waves can still get crowded since this is on every surfer's Bucket List. Mal País & Santa Teresa in the southwestern corner of Península de Nicoya are great options to catch some epic waves alongside some of the best natural beauty in Costa Rica. Thirty years ago, an intrepid surfer hacked his way through the jungle in search of this pristine and untouched surf beach (or so the legend goes). These days, Santa Catalina is still one of the best places to surf in all of Central America, with consistent right and left breaks for more than 200 yards over lava reef - and it's a lot easier to get there. Nuqui on the Pacific coast of Colombia offers that country's best surf, with Playa Olímpica and Guachalito nearby. You'll miss the whale-sighting season unless you go from June to October, but you can also check out Barranquilla on the Caribbean coast, which offers smaller waves but the most famous carnival in Colombia. The most beautiful and powerful barrels in the world are produced by the sandbars off Playa Zicatella in Mexico. They're definitely for experienced surfers, so get ready to break a few boards - and possibly a few bones if you drop in on the aggressive locals. Tamarindo (or "TamaGringo" because of the hordes of North Americans that vacation and live there) is Costa Rica's most popular surf destination. It's managed to hold on to its beachy village vibe (just barely), even as modern resorts, luxury condos, and high-end restaurants pop up. But the long expanse of beach - and great surfing near the estuary and other spots - has never ceased. There's plenty of room and smaller waves for beginners to get their chops, but also a handful of great surf beaches not far out of town. Speaking of Tamarindo, when you're there, go check out nearby Playa Avellanas, where the big, hollow, and fast waves create some dream tubes near the river mouth. Or take a day trip to the legendary Witch's Rock, made famous in the iconic surf movie, Endless Summer II, where you can enjoy perfect lefts and rights on either side of the offshore rock formation. The crown jewel of the El Salvadorian coastline, Punta Roca is a perfect right point break for experienced surfers who don't mind some rocks. The waves are powerful; the weather is perfect, and it's not crowded - just be careful to make nice with the locals. Surfing has become plenty popular in Brazil since it was imported to the country in 1928, and there's no better place to ride a wave than Santa Catarina, where swells that come down from the North Atlantic and up from Antarctica produce consistent waves. Santa Catarina hosts the ASP World Championship each April, and we encourage you to check out the beautiful capital, Florianópolis, too. 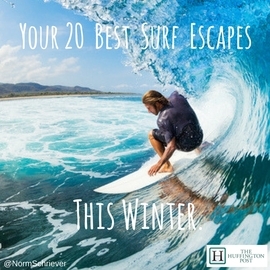 Cabo is best known for sunbathing and beachside nightlife, but there's some great surf there, too. There are plenty of breaks in the area suitable for beginners, and experienced surfers can rise to the challenge at the Monuments, Zippers, or Santa Lucia de los Cerritos. Flights in and out of Cabo San Lucas are easy, and you can usually find inexpensive accommodations because there are so many to choose from. Sitting on the Pacific coastline of Peru near the border, Máncora is a great place for experienced surfers. It might be hard to find room in the lineup so it's not the best place for beginners, but Máncora is also a great spot for tourists to chill out and enjoy some nightlife after hiking Machu Picchu. Ecuador is an emerging favorite for travelers and backpackers, but surfers have enjoyed the country's 2,200 miles of coastline for a long time. Along the legendary Ruta del Sol - route of the sun - sits the town of Montañita, popular for its many beaches and Carnival celebration each February. But it also offers consistent surf from November to April, with two-meter waves from January to March. But bring your wetsuit because the water temps can be lot colder than in Central America. Don't feel "wave envy" if you can't get enough time off of work to head further south, because along the 350 KM coast from Santa Barbara to San Diego, California offers great waves only a short (and cheap) flight from most U.S. and Canadian cities. Touch down in Los Angeles and hit the mecca of Huntington Beach, where there's plenty of room on either side of the pier, chill in Malibu Beach, or beginners and longboarders will dig El Porto. From the Wedge to Rincon, Scripps Beach to Black's Beach in San Diego County, SoCal is truly a surfer's paradise. Surfing in Cuba? You got it, as the communist island nation governed by the recently passed Fidel Castro has a very small, but resourceful and dedicated, surf crowd. In and around Havana, the best waves are from November through January, while on the southeastern part of the island, you'll find the best surfing during hurricane season from August to early November. You won't find any crowds, but you will have to bring your board, as there are no surf shops in Cuba since the government frowns on this American pastime. In fact, the first Cuban surfers had to make their boards out of refrigerator foam covered with boat resin and used candles to wax them! While Cuba is changing and attracting more tourists by the day, you may want to go surf there now while it's still truly a unique adventure. Need some more advice for your tropical surf getaway? Contact me at hi@NormSchriever.com.